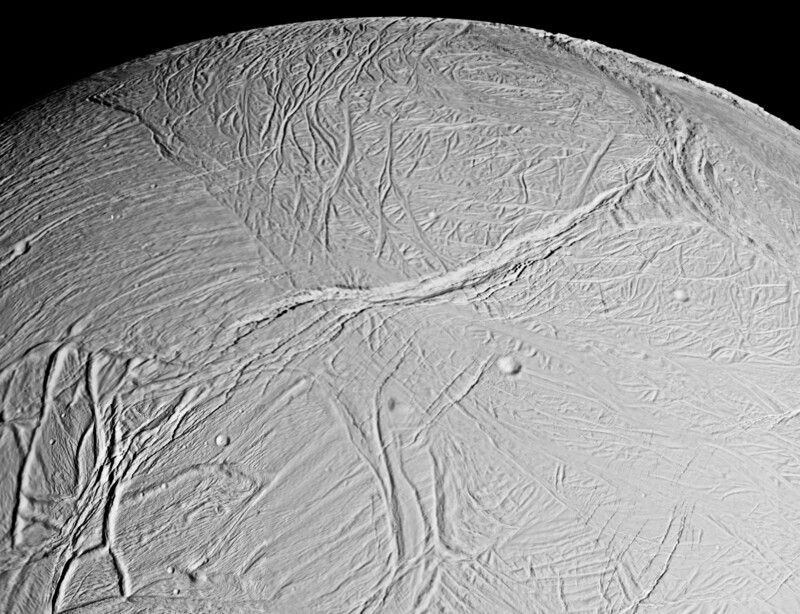 Dramatic images of the surface of Saturn's brightest, whitest moon, Enceladus, show a body that has undergone extensive re-surfacing through a variety of geological processes. Feb 18, 2005: False Color Look at Enceladus - A fresh look at Enceladus (505 kilometers, 314 miles across) reveals tempting new details about the brightest real estate in the Solar System. 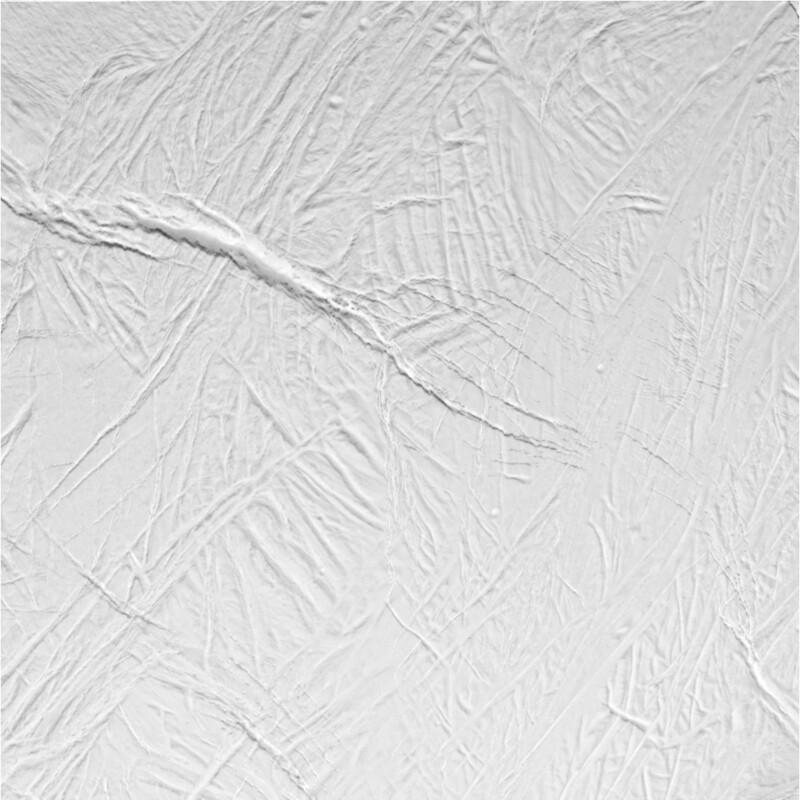 Feb 18, 2005: Seeing Enceladus' Faults - This high-resolution image from Cassini shows a 70 kilometer x 84 kilometer (43 mile x 52 mile) region of "smooth plains" terrain on Enceladus' surface located slightly north of the equator on the moon's Saturn-facing hemisphere. 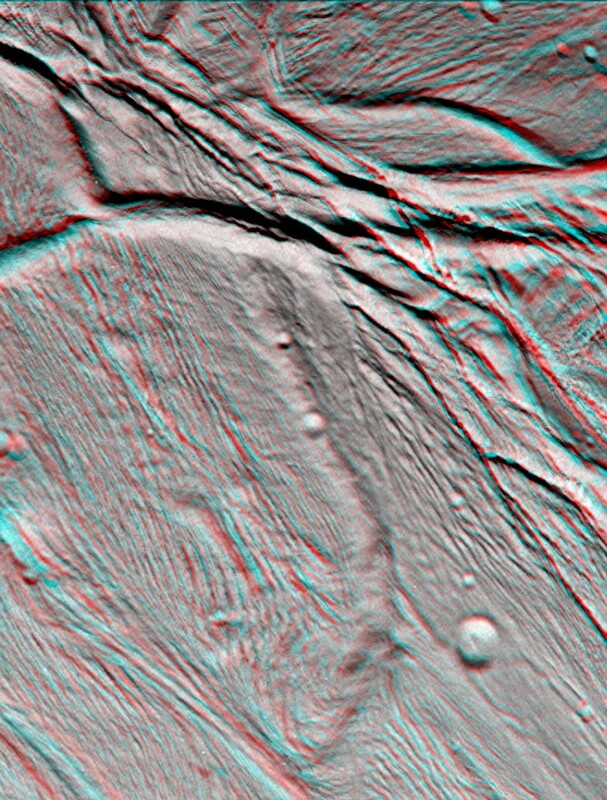 Feb 18, 2005: Cassini Views Enceladus in Stereo - The Cassini narrow angle camera took images of Enceladus' ropy, taffy-like topography from many different angles as it flew by on February 17, 2005. 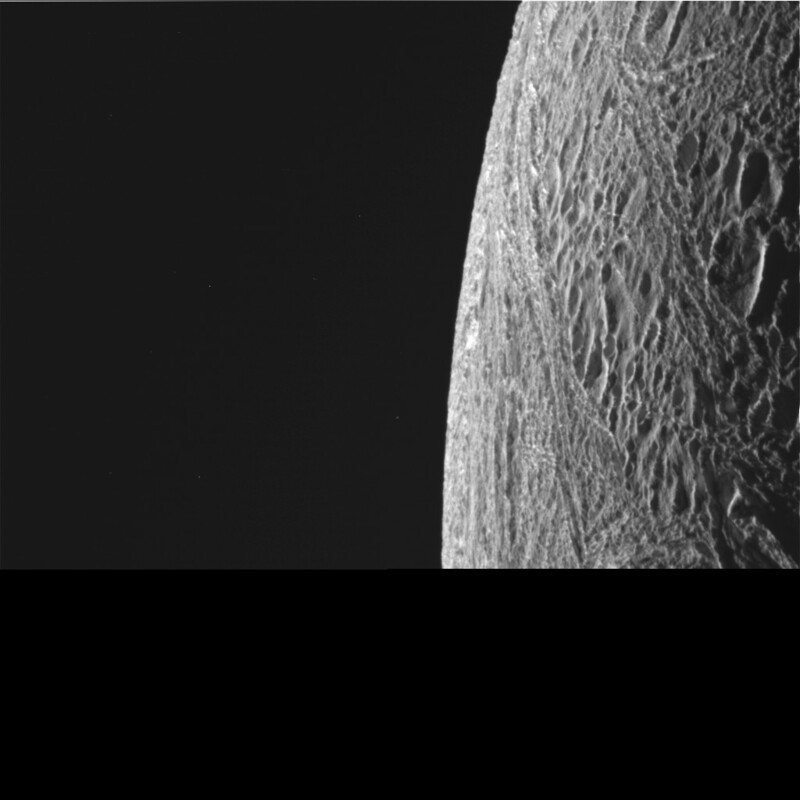 Feb 18, 2005: Enceladus Mosaic - This spectacular view is a mosaic of four high resolution images taken by the Cassini narrow angle camera on February 16, 2005 during its close flyby of Enceladus. 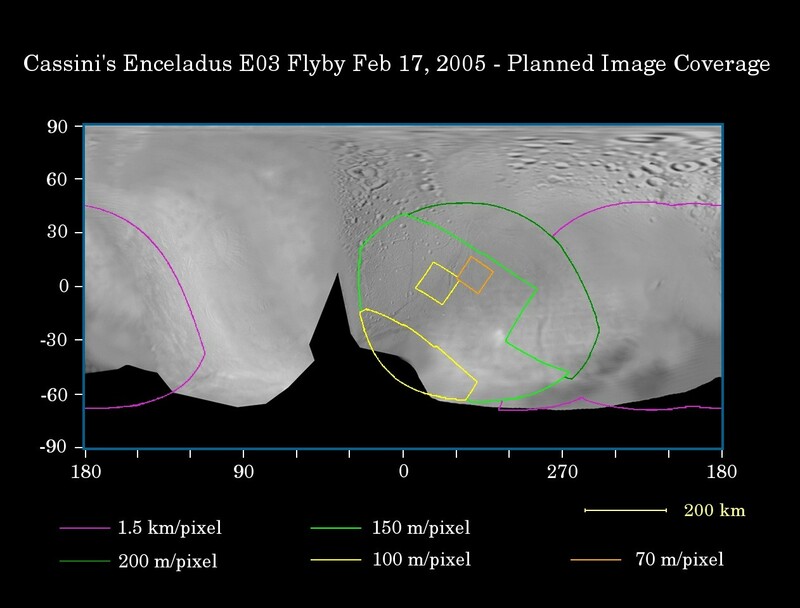 Feb 17, 2005: Enceladus First Flyby - This map of the surface of Enceladus (505 kilometers, 314 miles across) illustrates the regions that will be imaged by Cassini during the spacecraft's first very close flyby of the moon on February 17, 2005. 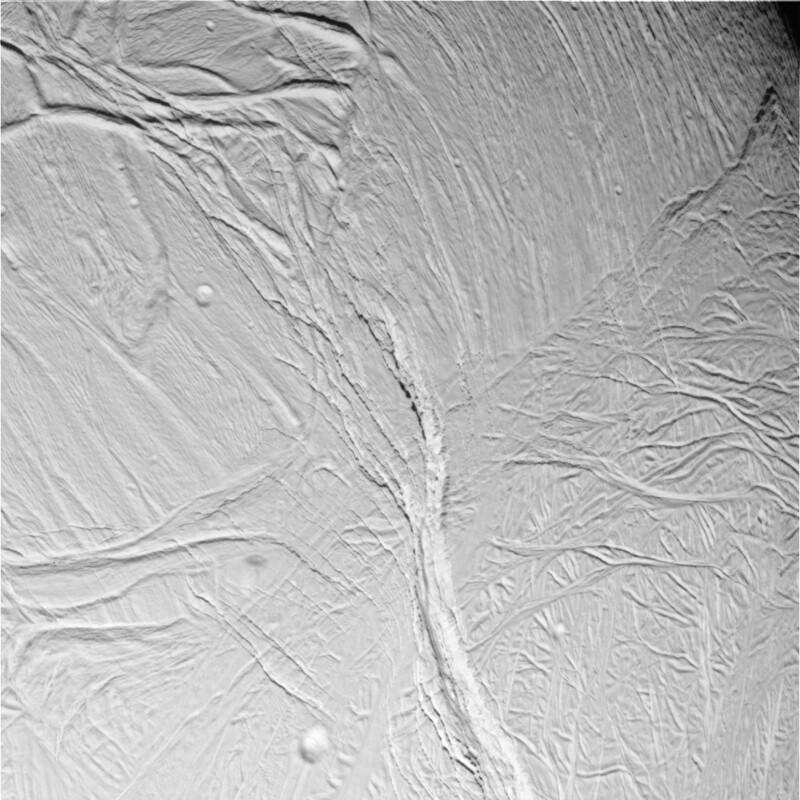 Feb 17, 2005: Enceladus 'E03' Flyby Raw Preview #4 - This image was taken during Cassini's first close approach to Enceladus. 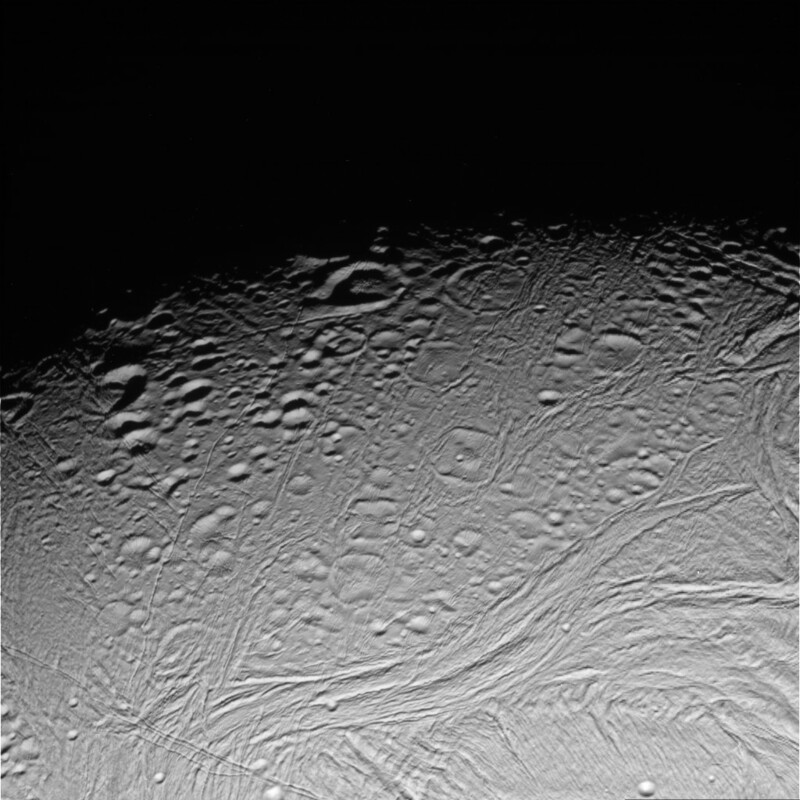 Feb 17, 2005: Enceladus 'E03' Flyby Raw Preview #5 - This image was taken during Cassini's first close approach to Enceladus. 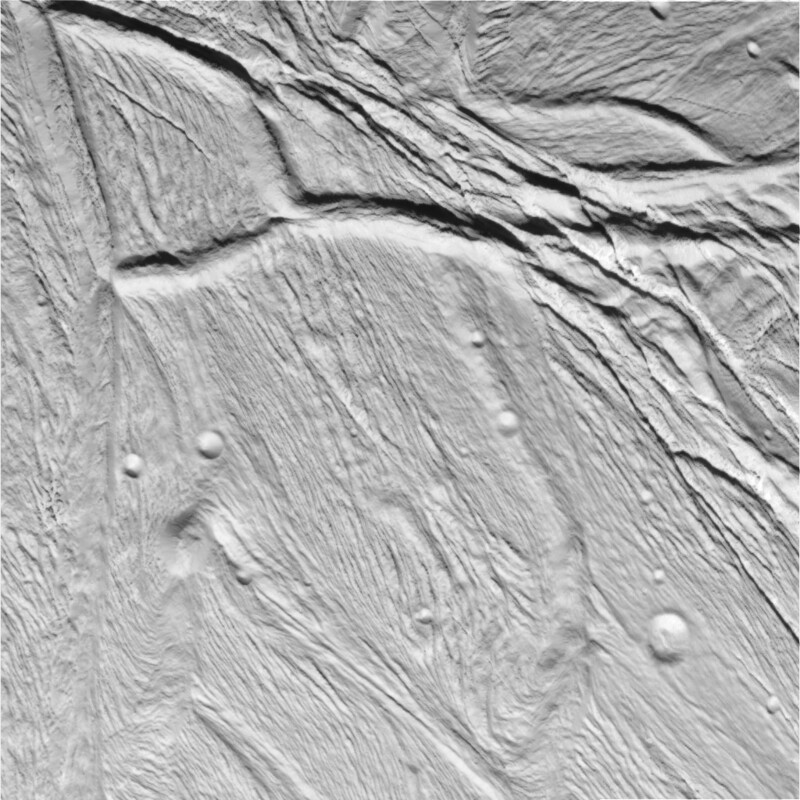 Feb 17, 2005: Enceladus 'E03' Flyby Raw Preview #6 - This image was taken during Cassini's first close approach to Enceladus. 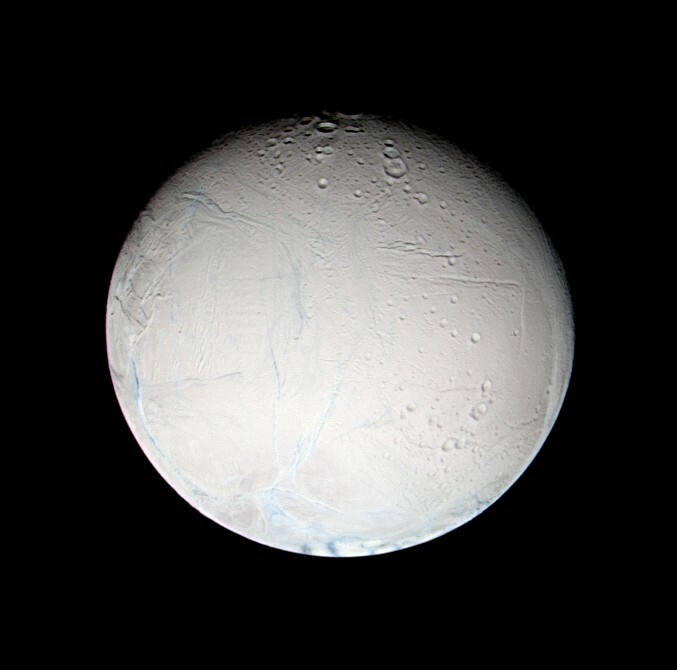 Feb 17, 2005: Enceladus 'E03' Flyby Raw Preview #7 - This image was taken during Cassini's first close approach to Enceladus. 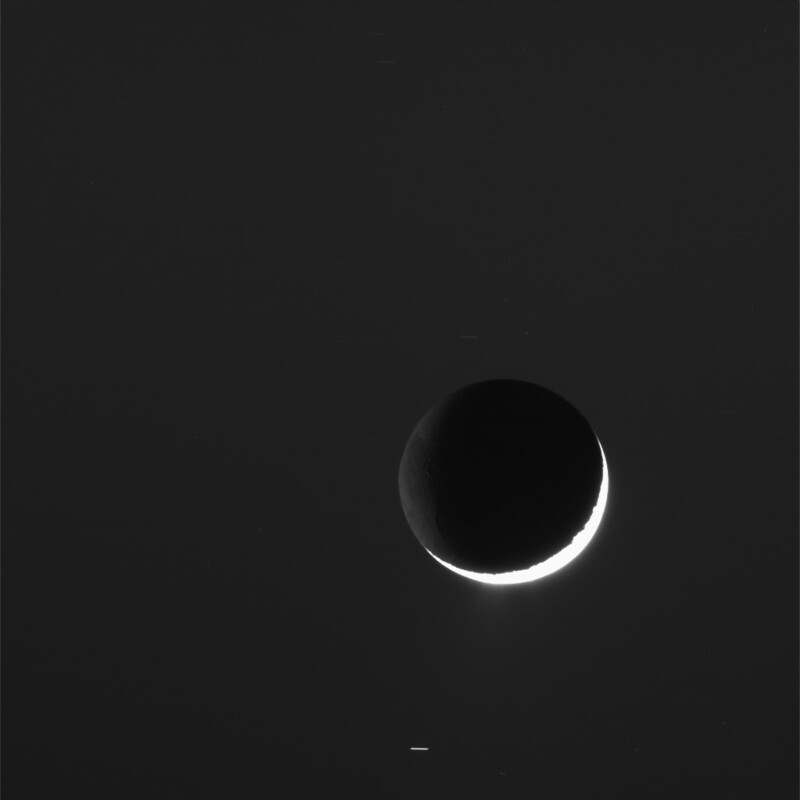 Feb 17, 2005: Enceladus 'E03' Flyby Raw Preview #8 - This image was taken during Cassini's first close approach to Enceladus. 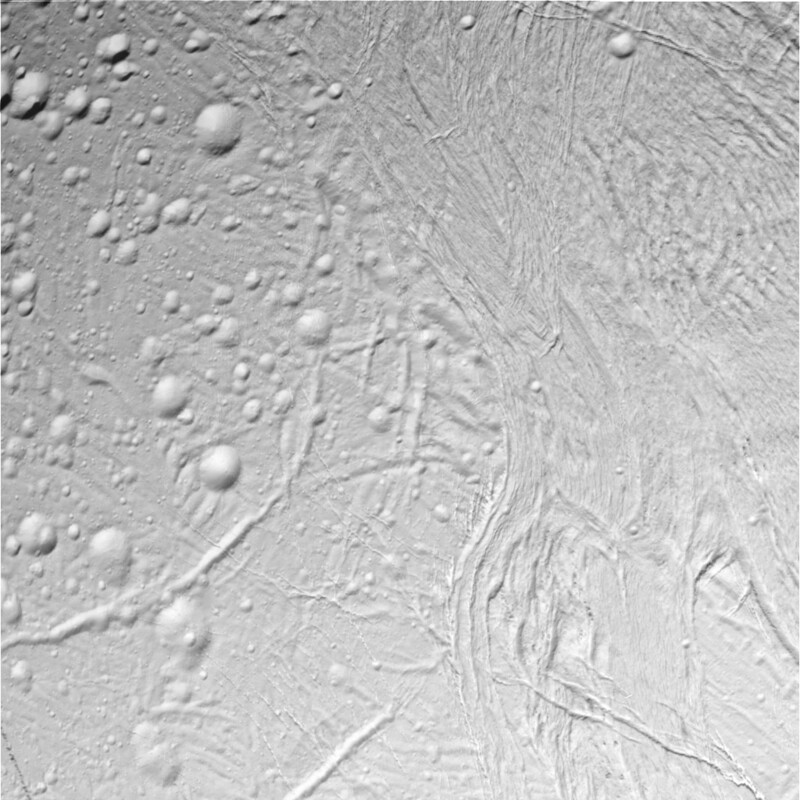 Feb 17, 2005: Enceladus 'E03' Flyby Raw Preview #9 - This image was taken during Cassini's first close approach to Enceladus. 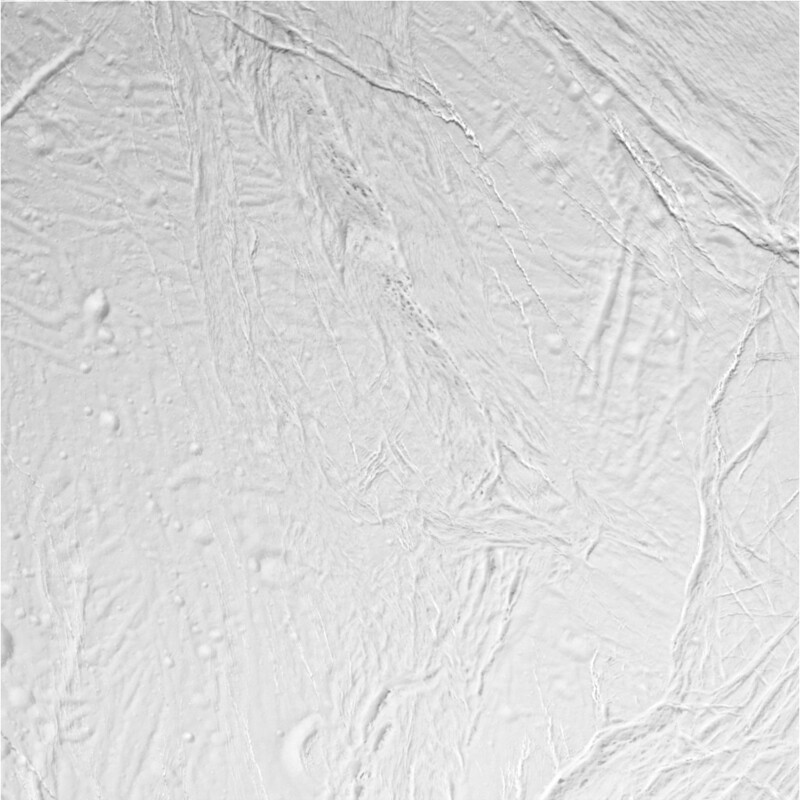 Feb 17, 2005: Enceladus 'E03' Flyby Raw Preview #10 - This image was taken during Cassini's first close approach to Enceladus. 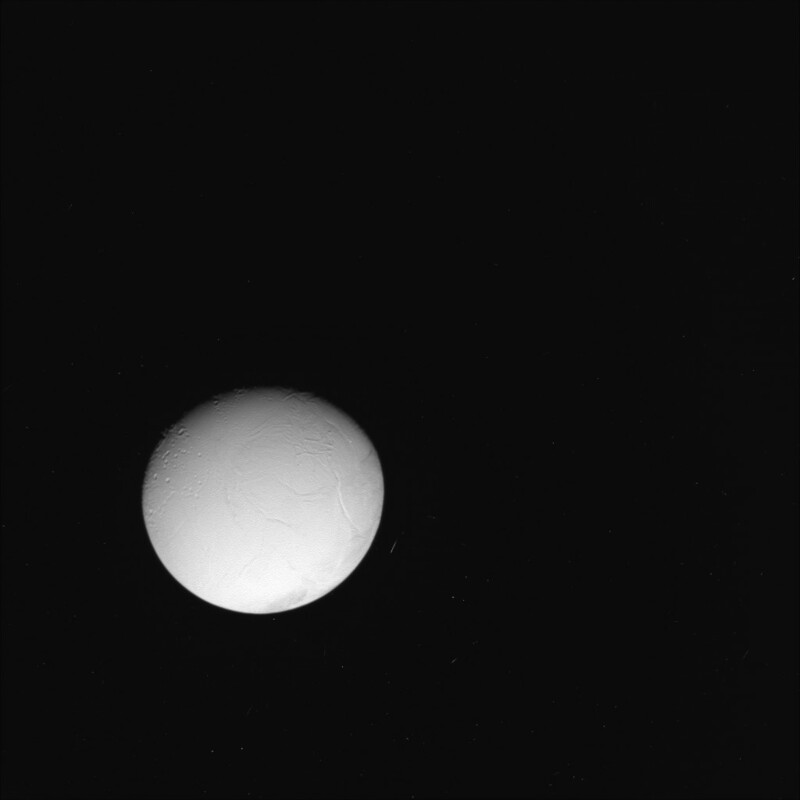 Feb 17, 2005: Enceladus 'E03' Flyby Raw Preview #11 - This image was taken during Cassini's first close approach to Enceladus. 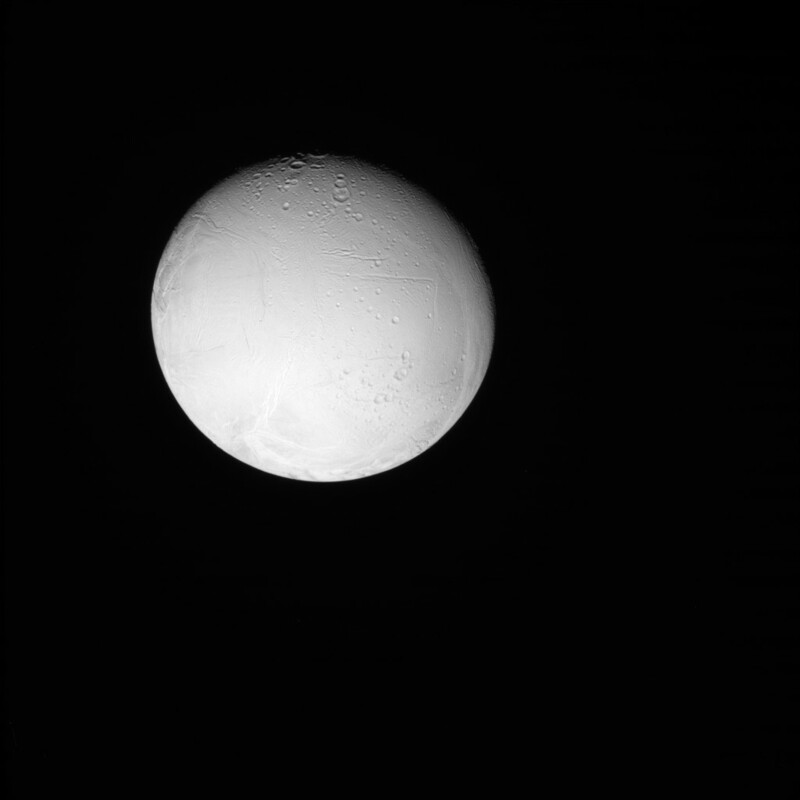 Feb 17, 2005: Enceladus 'E03' Flyby Raw Preview #12 - This image was taken during Cassini's first close approach to Enceladus. Feb 17, 2005: Enceladus 'E03' Flyby Raw Preview #13 - This image was taken during Cassini's first close approach to Enceladus. 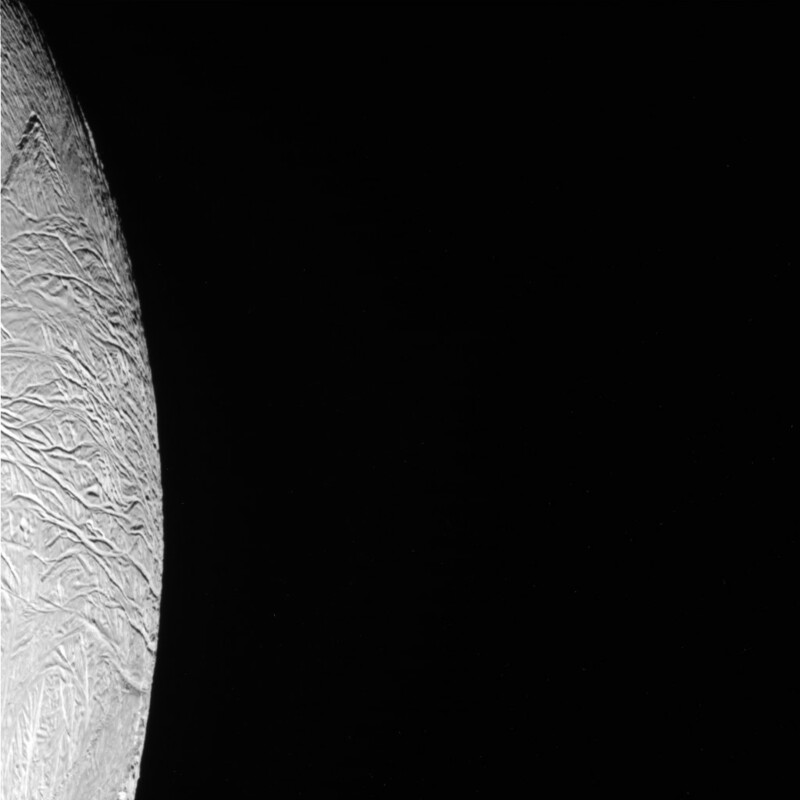 Feb 17, 2005: Enceladus 'E03' Flyby Raw Preview #14 - This image was taken during Cassini's first close approach to Enceladus. 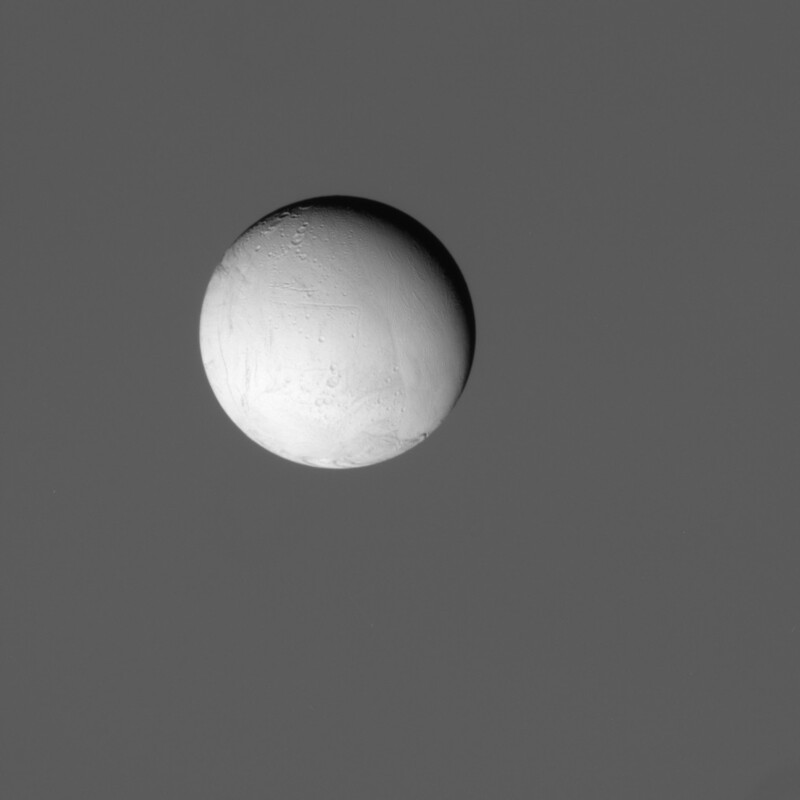 Feb 17, 2005: Enceladus 'E03' Flyby Raw Preview #15 - This image was taken during Cassini's first close approach to Enceladus. 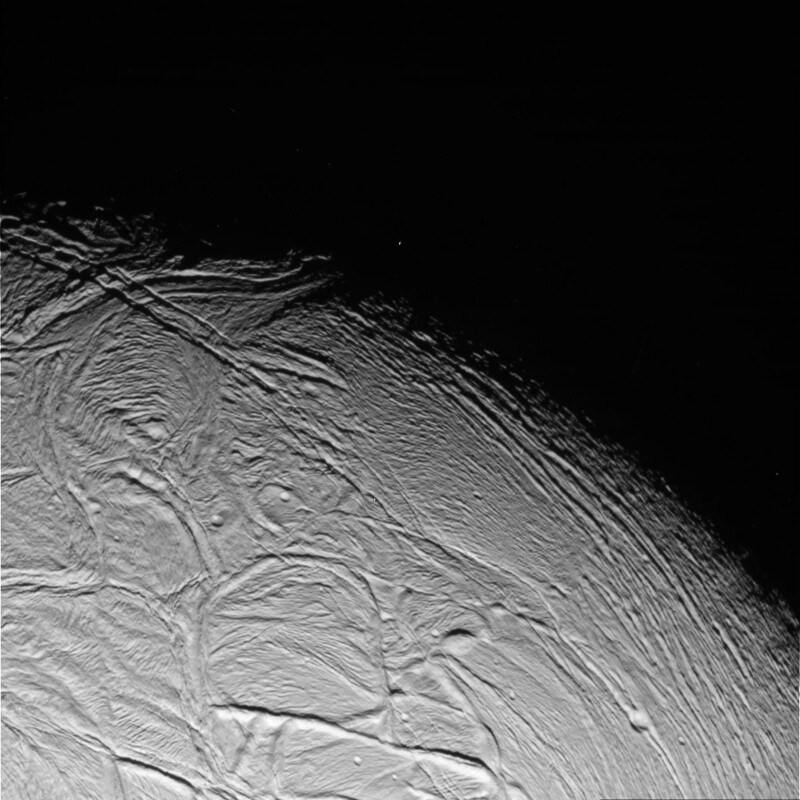 Feb 16, 2005: Enceladus 'E03' Flyby Raw Preview #1 - This image was taken during Cassini's first close approach to Enceladus. 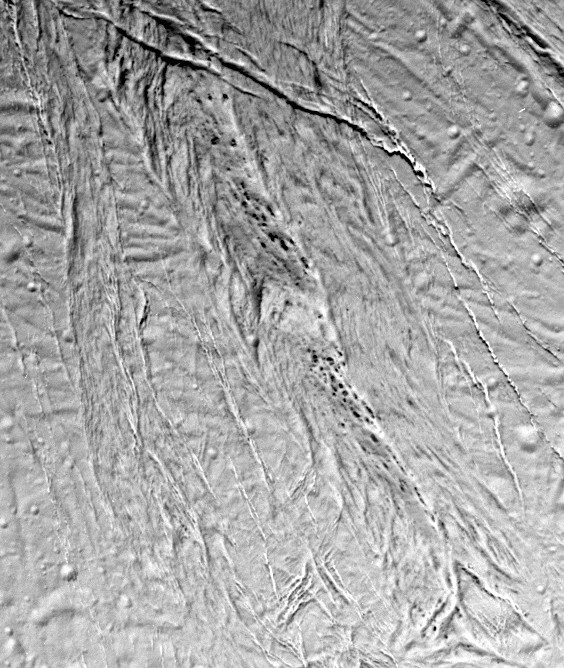 Feb 16, 2005: Enceladus 'E03' Flyby Raw Preview #2 - This image was taken during Cassini's first close approach to Enceladus. 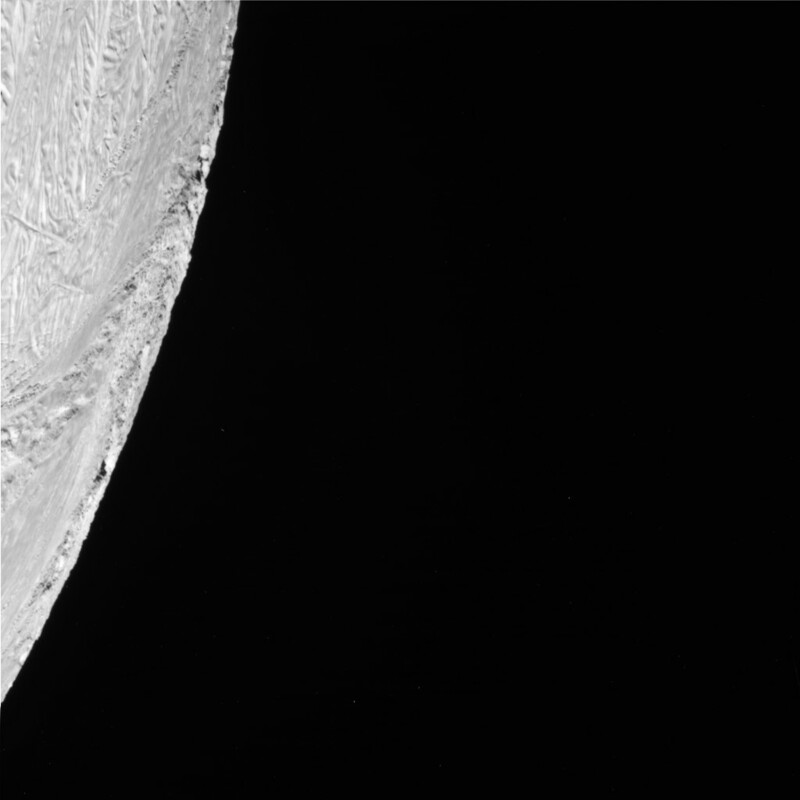 Feb 16, 2005: Enceladus 'E03' Flyby Raw Preview #3 - This image was taken during Cassini's first close approach to Enceladus.